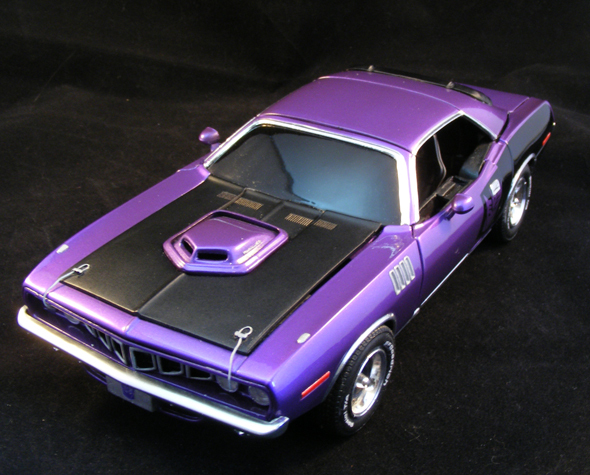 Transformers New Zealand Forums - View topic - Alternators Shockwave reshell into 1971 Muscle car! Here he is, finally complete. My first of many to come "Musclebots". The idea of these guys is to take the Autobots and Decepticons we all know and love, and completely change their alt modes as if they came to earth during the golden era of the vintage American Muscle car (1960's and 70's). 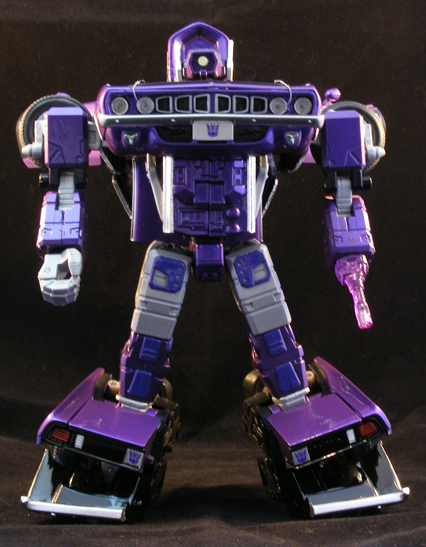 First up we have Shockwave. 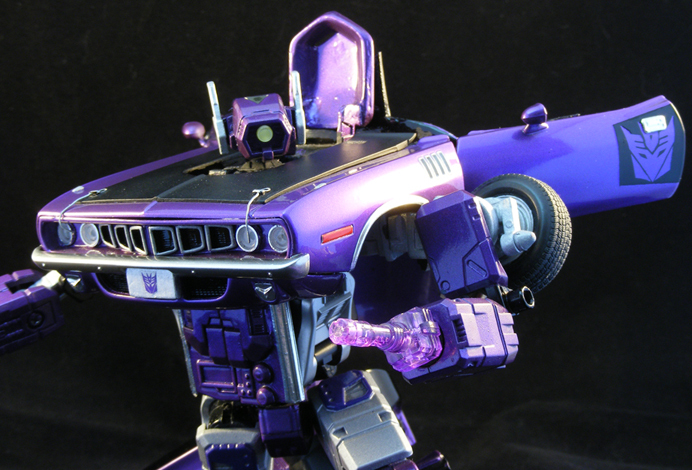 When i first saw a picture of a purple 1971 Plymouth Hemi 'Cuda online, i immediately thought of Shockwave. 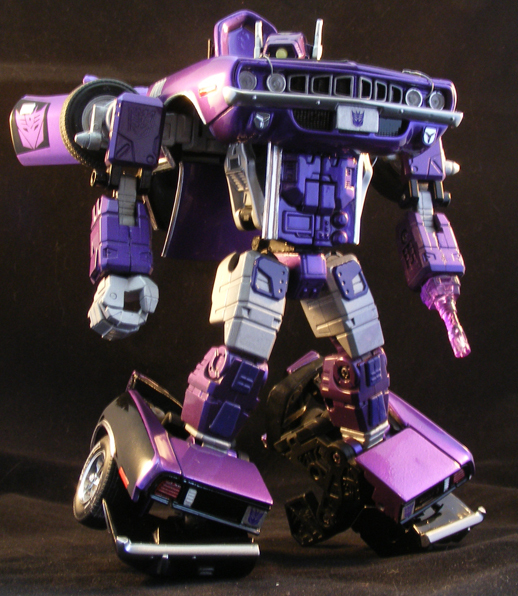 Just the combination of the purple paint and that big aggressive grille which looks like G1 Shockwave's chest area, it was a perfect fit. So i got to work. I took a bog standard Alternators Shockwave/blast, bought a 1/24 scale plastic model kit of a Plymouth Hemi 'Cuda, and got to work cutting stuff up. Once the major building and fabrication work was done i moved on to paint. 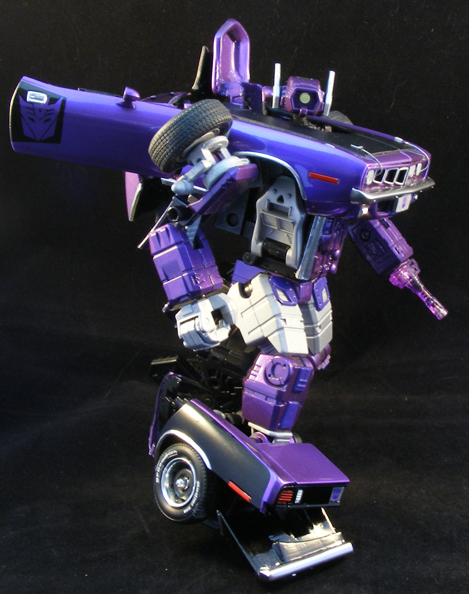 The real car has a very specific shade of purple which is called "plum crazy" purple. I could not find this shade ANYWHERE, and when i did it was waaay too much $$$ to buy and to ship, so i went to my old man and asked him if he could mix me up a custom shade. He mixed up a close to the original base coat, which i then lacquered and added some purple pearl powder to and it came out perfect! 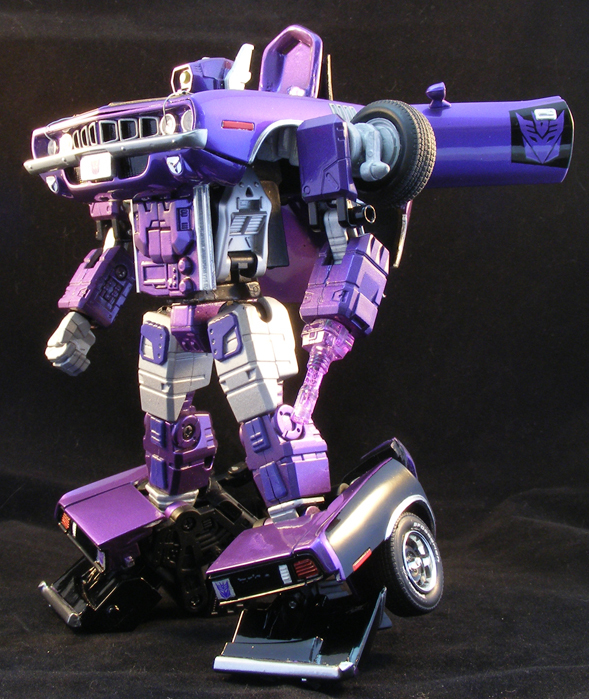 This is about as close as you can get to the real factory color and it looks awesome on the toy as you can see. The paint has been wet sanded and then buffed just like a real full-size custom paint job! Once the paint was done i airbrushed the side graphics and decided to give it a nice little custom touch, replacing the "Hemi" lettering with a painted on Decepticon logo. I then chrome-painted the bumpers, and added bare metal foil to the trim. I decided to give the hood an era-correct matte black paint job, and added some scratch built hood pins. Most of the interior was sacrificed for the build, but the interiors to Alts were pretty superfluous anyway so its no big deal. The wheels cannot rotate either, another sacrifice to keep the wheels from having pins drilled through them and ruining the look. The front wheels detach via strong rare earth magnets, as i had to make them that way because with the added width of the 1971 'Cuda body, the original wheels no longer fit next to the fenders behind the shoulders in the robot mode like they did on the original, much narrower Mazda RX-7 body. But as you can see, you cannot see any of these sacrifices when the piece is on display. Anyway, thats about it. 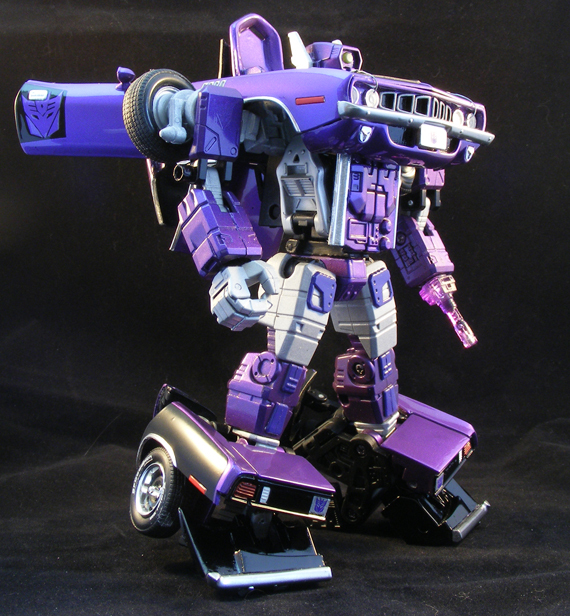 Thanks for looking and dont forget to check eBay for Shockwave's auction soon! 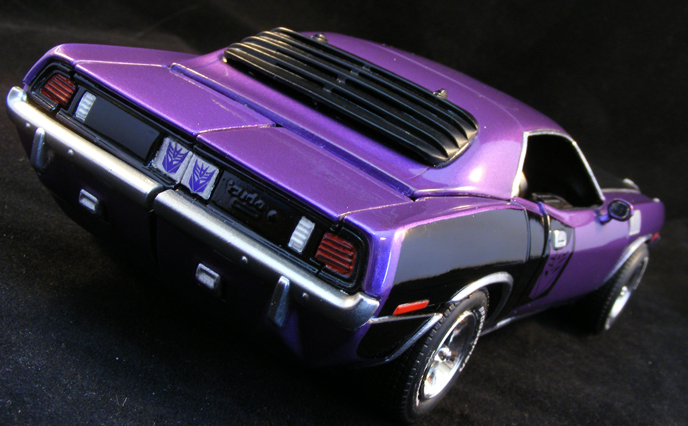 Re: Alternators Shockwave reshell into 1971 Muscle car! This is absolutely beautiful man. I mean, really, those colours just pop out. Completely agree about the chest area. Magnificent choice and execution! Now on eBay! Dont miss out on your chance to own this truly unique piece!